A lightened version of a frozen mousse, this beautiful make-ahead company dessert celebrates Ontario Peaches and their happy companions, Ontario Blueberries. Place yogurt in cheesecloth-lined sieve set over bowl; set aside. Purée blueberries and simmer with 1/4 cup (50 mL) of the sugar for 5 minutes. Stir in amaretto. Stir cornstarch with 1 tbsp (15 mL) cold water; stir into blueberries. Boil, stirring, for 1 minute; let cool to room temperature. Peel and purée peaches with lemon juice and remaining sugar; transfer to large bowl. Fold in whipped cream and drained yogurt; pour into 8-inch (2 L) springform pan. 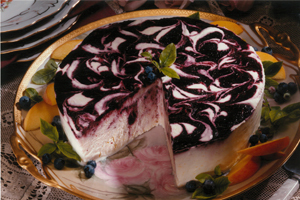 Spoon blueberry mixture decoratively over mousse; draw knife through mousse and blueberries to form swirls. Cover and freeze at least 8 hours and up to 3 days. If frozen more than 8 hours, remove to refrigerator 30 minutes before serving in wedges.